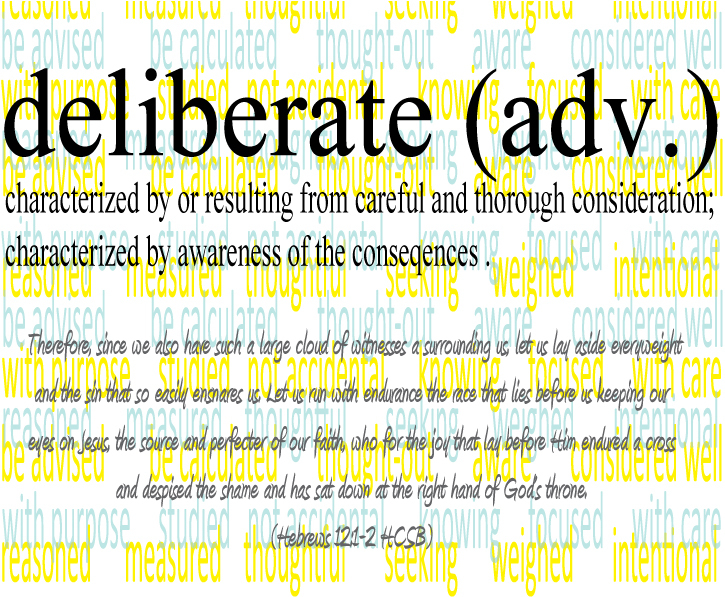 As in “be deliberate” or advised, calculated, considered, knowing, measured, reasoned, studied, thoughtful, thought-out, weighed, intentional. Merriam Webster Dictionary defines deliberate (the adverb) as “characterized by or resulting from careful and thorough consideration” or “characterized by awareness of the conseqences”. in seeking God through active study and prayer. in loving others by actively searching for ways to show love, not just stumbling upon it. in my marriage by setting aside time for my husband, not just giving him what’s left at the end of an exhausting day. as a parent by being consistent. in friendships by picking up the phone or dropping a note in the mail more than every once in a while. in making choices that are better for my body, my mind and our budget. in homemaking by creating a comfortable place for my family and a welcoming place for friends. in business by setting goals that line up with my dreams and not chasing tangents. This entry was posted in About me, Be Deliberate, Winter 2012. Bookmark the permalink.